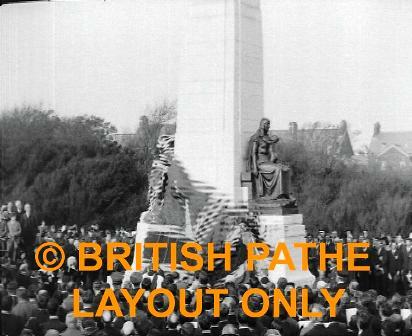 Lytham & St.Annes on the Sea Lancashire - Local History - Lancashire - Beautiful War Memorial unveiled at St. Annes-on-Sea in presence of Mr. Stephen Walsh. Pathe News, 1924. Lancashire - Beautiful War Memorial unveiled at St. Annes-on-Sea in presence of Mr. Stephen Walsh. Pathe News, 1924. "Lancashire - Beautiful War Memorial unveiled at St. Annes-on-Sea in presence of Mr. Stephen Walsh. Pathe News, 1924". Produced by Pathe News, 1924. The clip only lasts one minute but is quite clear. The man stood between the Town Clerk and the Mayor looks like Lord Ashton. Stephen Walsh and senior army officers walking slowly past a crowd of people. The memorial surmounted with the statue of a woman with her arms outstretched; camera tilts down to show a Union Jack covering the base of the statue, a large crowd watch as the flag drops from the memorial. Looking over the heads of the crowd; the two-minute silence. The mayor laying a large wreath on the memorial. A group of children - mainly little girls - walking past carrying bouquets of flowers. Children laying flowers at the base of the memorial.